In Intersession, the first time I used Lecture Tools, I asked students who didn’t participate in the system to write down their answers on paper and hand them in. (I give a small number of “activity points” for answering Lecture Tools questions, along with other small activities, based on recommendations to give some sort of low-stakes credit, even if minimal, to reinforce the value of these activities to students – e.g, Caldwell, 2007; Duncan 2005.) This strategy was … not great. It wasn’t feasible for me to grab the written student answers immediately after a question had been asked. Receiving the written answers to questions at the end of class, there was no way for me to know when the students had written the answers down, and I’d guess that many students would have felt considerable temptation to just write down their answer after peer discussion and any explanations from me. I had no idea what these students had actually been thinking when the questions were asked, and this felt like a very lame approximation of the intended learning activity. Another strategy was needed for those unable to participate in Lecture Tools. I angsted about this during the few weeks between Intersession and the start of Fall classes. Despite my best efforts, I could not come up with anything that seemed equivalent to the Lecture Tools interactions and activities in class (at least, that wouldn’t be completely unfeasible to manage). Instead, just as the term began, I opted to use a completely different activity that still required that students to engage with course concepts, but that would also help me in planning the next class. I gave students the option to either answer questions in class via Lecture Tools (for 5 points a class/week), or they could submit a small written assignment in the LMS in the next five days. The assignment was to submit a question on the next class’s topic, and was worth 5 points. This is not exactly a new, innovative pedagogical technique … in fact, it is similar to strategies I’d used in the past. (I know of many other educators who use similar methods … and there are lots of examples in the literature – e.g., Chin and Brown 2002; Colbert et al. 2007, Marbach-Ad and Sokolove 2000.) Several years ago, I asked students to submit questions on paper at the end of class, later by email. Back then, it was a LOT of work just managing the submissions, with nearly every student providing one a week. Now, I knew that the number of students who would be submitting questions in lieu of using Lecture Tools would be a small fraction of my classes. 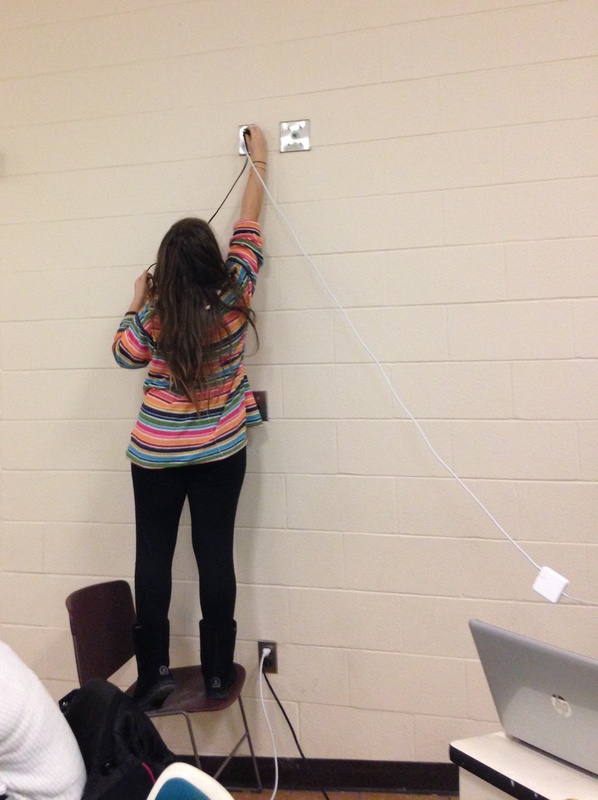 There weren’t many accessible power outlets in this lecture hall. I’ve been teaching using a blended, flipped model – students are expected to read and view online lectures, and complete an online quiz each week before we meet in class. I had already been using the online quiz item analysis and student questions (from emails, and in office hour discussions) to help plan my classes – a “just-in-time-teaching” (JiTT) strategy. (For more on JiTT, see Novak et al. 1999 and other references below.) The weekly question submissions provided additional, highly relevant information. Most of the student questions revealed where students were confused, or the topics they were really interested in. The assignment requirement to explain what the student found confusing or challenging helped unearth some misconceptions that could be addressed. Sometimes, I could see distinctions between the types of questions asked by students in the Nursing section compared to those in the Biology/Biochemistry section of the course, which was also helpful in customizing teaching approaches for each group. These questions quickly became the most valuable tool in planning my classes. While it did take some time to go through the questions, respond, and enter a mark, only a portion of the class would submit questions, so it was usually manageable. (Each week, I’d get between 10-25 question submissions from each of my two sections.) The questions were typically thoughtful, and sometimes insightful and intellectually challenging. Occasionally, students related personal links to course material, which surprised and moved me. You’ve probably already noted that my alternate activity does not actually require students to attend class. (In fact, you could still answer Lecture Tools questions without attending class, though I think it would be challenging to follow along elsewhere). Many instructors differ in opinion on this, but I’m reluctant to deliberately penalize students who don’t come to class. (I do know that attendance has been reported to correlate with performance/GPA, but there are likely some key confounding factors.) Most students should benefit from attending class, if I’m doing my job well, but I also know that it’s possible to learn the material on your own if you’re highly motivated and have good learning strategies. Overall, I care more that students learn than that they are physically present in my classroom for a given number of hours a term. I would prefer students to come to class, as I do try to target misconceptions and challenging topics that are common to the group, and because some of the in-class activities involve students interacting with one another. Peer teaching can be highly effective, and diversity is helpful. (I also like to interact with my students!) However, I also know that students have lives outside of university, and are dealing with other commitments, stresses, and sometimes health issues (e.g., Westrick et al. 2009). While I hope academic work is a high priority for students, sometimes it will necessarily take the back seat to a family, health, work, or legal emergency or crisis. By the way, I release all of my slides, Lecture Tools questions, and I’ll scan and post notes made on the doc-cam if I think they’ll be useful. I record audio of my lectures and post them as mp3s on the course LMS. This is a huge shift from my early years teaching, where I felt I was obliged to withhold some stuff – e.g., by posting only partial slides ahead of class – to encourage attendance. I was also very nervous about recording my lectures – “What if I made a MISTAKE?!?! (I have come to the realization that if I do make a mistake – and I’m human, so I will! – it’s better that I know it, and can make a correction.). I’m over those fears now, and feel pretty good about sharing as much as I can. And (most) students are still coming to class! Not everything worked perfectly over the past couple of terms. The fact that a last-minute workaround option did work was a nice surprise. Even if I were to move away from a web-based CRS, I will try to use something similar to the weekly submitted question activity. Do you use JiTT? Solicit student questions on challenging/confusing material? If you have some strategies or questions, leave a comment below! Caldwell, J. E. 2007. 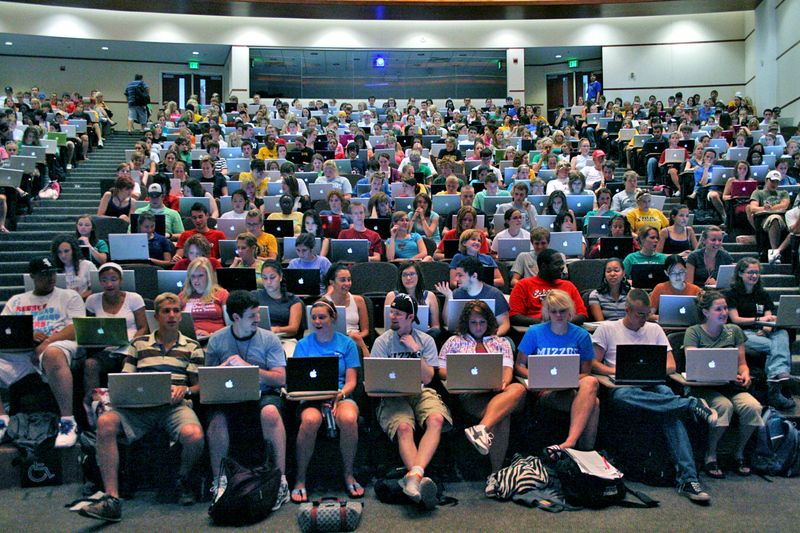 Clickers in the large classroom: Current research and best-practice tips. CBE-Life Sciences Education 6(1): 9-20. doi: 10.1187/cbe.06-12-0205. Chin, C., & Brown, D. E. 2002. Student-generated questions: A meaningful aspect of learning in science. International Journal of Science Education 24(5): 521-549. doi: 10.1080/09500690110095249. Colbert, J. T., Olson, J. K., and Clough, M. P. 2007. Using the web to encourage student-generated questions in large-format introductory biology classes. CBE-Life Sciences Education, 6(1), 42-48. doi: 10.1187/cbe.06-07-0171. Duncan, D. 2005. Clickers in the classroom: How to enhance science teaching using classroom response systems. San Francisco: Pearson Education. Gaudreau, P., Miranda, D., and Gareau, A. 2014. Canadian university students in wireless classrooms: What do they do on their laptops and does it really matter?. Computers & Education, 70: 245-255. doi:10.1016/j.compedu.2013.08.019. Marbach-Ad, G., and Sokolove, P. G. 2000. Can undergraduate biology students learn to ask higher level questions?. Journal of Research in Science Teaching, 37(8), 854-870. doi: 10.1002/1098-2736(200010)37:8<854::AID-TEA6>3.0.CO;2-5. Marrs K.A. and Novak G. 2004. Just-in-Time Teaching in Biology: Creating an Active Learner Classroom Using the Internet. CBE-Life Sciences Education 3: 49-61. doi: 10.1187/cbe.03-11-0022. Moravec, M., Williams, A., Aguilar-Roca, N., and O’Dowd, D. K. 2010. Learn before lecture: a strategy that improves learning outcomes in a large introductory biology class. CBE-Life Sciences Education 9(4): 473-481. doi: 10.1187/cbe.10-04-0063. Mueller, P. A., and Oppenheimer, D. M. 2014. The Pen Is Mightier Than the Keyboard Advantages of Longhand Over Laptop Note Taking. Psychological Science, 25 no. 6 1159-1168. doi: 10.1177/0956797614524581. Novak, G, Patterson, E.T., Gavrin, A.D., and Christian, W. 1999. Just-In-Time Teaching: Blending Active Learning with Web Technology. Upper Saddle River, NJ: Prentice Hall. Schraw, G., Crippen, K. J., and Hartley, K. 2006. Promoting self-regulation in science education: Metacognition as part of a broader perspective on learning. Research in Science Education 36(1-2): 111-139. Westrick, S. C., Helms, K. L., McDonough, S. K., and Breland, M. L. 2009. Factors influencing pharmacy students’ attendance decisions in large lectures. American Journal of Pharmaceutical Education 73(5): 83. PMCID: PMC2739066. Zhu, E., Kaplan, M., Dershimer, R. C., and Bergom, I. 2011. Use of laptops in the classroom: Research and best practices. CRLT Occasional Papers 30: 6. You made a cool hybrid of strategies that are immensely effective for my classes: JiTT & Blended/flipped & in-class polling. At Mount Royal University we have standardized the polling hardware so that it can be used in multiple classes (students don’t buy separate devices for different classes). I tried out the “webclicker” option from iClicker when it first came out. All answers were lost and tech support merely shrugged their shoulders. Although the technology is probably better now, it was such a hassle I don’t even consider software solutions: the hardware is robust. On top of software glitches, WiFi outages and dead batteries suggested crises that could happen which I didn’t want to deal with. However, I wish I had thought of your clever solution. Students who find out at the last minute still have an option – giving a rich and thoughtful post regarding the material. Keen students can make use of both options. The thoughtful response you use (I call it JiTT) is one use in Genetics. There are no points that count, but I assign it a percentage indicating how it fits with the criteria as you specify it. What exactly is the question? What did they do to answer the question her- or himself? A “D” grade is for “I don’t get promoters”. (That’s not even a question! Did they not take an English class?) Higher points for clearly stating what they’d like to know more about and telling me what they’ve done to address it, including websites or *gasp* the text! Like you, I get some very insightful answers and occasional gems that make me wonder why I wasn’t likewise baffled by the concept. A great scientist knows what questions to form and investigate. The facts and details are secondary, in my opinion. To sweeten the pot – as the questions have not answers – I sometimes make a FAQ that groups those frequently similar questions along with a response for all to read. Each JiTT response also gets a reply from me (again, small classes: 90 students). This is easy as because there are no points, if they really have nothing to say, they don’t say it. Of the remaining 50 or so responses, voice-to-text makes responses easy; cut-and-paste makes short work of similar replies. And, of course, the big JiTT payoff is that lectures are tailored just-in-time to address common concerns. Those of us who’ve taught the course several times already probably know these. New ones pop up that can be astonishing, insightful, and moving. After reading this article, I think I can be less dogmatic about “only the clicker hardware is robust enough for me to use for class polling”. It would be easy – even expostfacto – to make up for a massive outage of the response devices!